A good ink-water balance is important for high quality printing on lithographic offset printing presses. In order to be able to predict the performance on the press, the water absorbency of lithographic inks must be tested. The Lithotronic IV is the first device to determine the water balance performance of offset inks and fount solutionswith 1% accuracy. 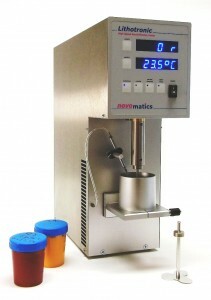 The instrument is equipped with automatic gap adjustment (known from upper class rheometers) and a ceramic dosing system. Temperature, shear-rate and fountain solution content are exactly regulated and are corresponding to the conditions on fast running printing presses. The modern software allows you a quick and safe data evaluation. Thus is testing and optimizing of your products already possible before the operation on the printing press. International manufacturers of fountain solutions, printing inks, binders and special additives use the instrument. TheLithotronic test method has become a semi-standard test for R&D and QC in ink and fount solution formulation; it is successfully approved by the EUROCOMMIT group. The Lithotronic IV is a state-of-the-art measuring device for accurate and reproducible determination of the amount and rate of water absorption of a lithographic ink. the sudden drop in torque at the point where the emulsion is saturated with water. on the emulsification properties must be investigated. Additional tests with various standard emulsions at increasing or decreasing rotation speeds can be performed. Rheology and flow properties are important to any kind of liquid and these properties are not easy to test as the viscosity of liquids depends on many parameters and conditions. To test these properties of a mixture of two non-compatible liquids is even more complicated. The Lithotronic IV instrument has been developed for these tests and offers a lot of important features, such as automatics temperature control, shear rate control and dispension rate control. The automatic dispension is a special feature which enables the user continues titration of a liquid into the sample during operation. The liquid that is added can be water, solvent, oil or anything else. By mixing these two liquids under controlled conditions, emulsification can be tested in a reproducible and standardized way.